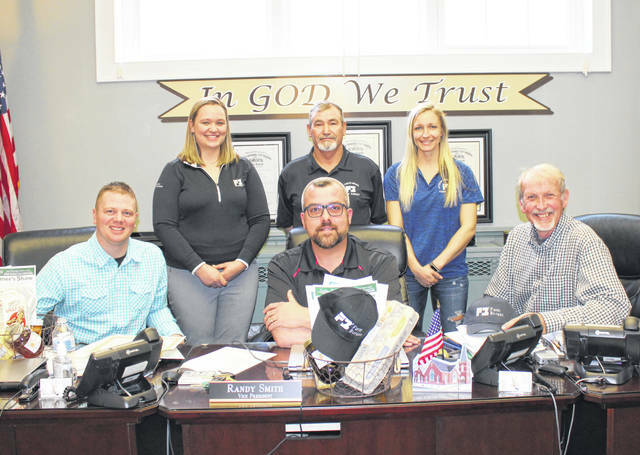 Faarm Bureau members Ashley Castor, Buddy Ervin and Alyssa Webb are pictured with commissioners Jimmy Will, Randy Smith and Tim Ihle. POMEROY — The Meigs County Commissioners recognized National Agriculture Week during last week’s regular meeting. Representatives from the local farm bureau were in attendance for the meeting, presenting each of the commissioners with a gift basket of local Meigs County farm products. National Agriculture Week was March 10-16. When Americans sit down to a meal each day, we sometimes take for granted the quality, abundance and value of the food we eat. Our supermarkets, grocery stores and restaurants offer a tremendous selection of fruits, vegetables, meats, dairy products and other food items, but we often forget the hardworking men and women whose skill and effort put that food on our tables. American agriculture plays a crucial role in strengthening our economy and in providing food for people around the world. While producing an abundance of safe and affordable food and fiber, our farmers also provide a source of jobs in our community. When you factor in all the jobs involved in processing, distributing and marketing food and fiber products, you see that American agriculture is truly everywhere and touches everyone in almost every way. American agriculture is our nation’s largest employer. More than 22 million people today work in the agricultural industry. World population is expected to reach 7.9 billion by the year 2020 and American agriculture is poised to reach the demands of feeding this growing population. Now, therefore, we, the Meigs County Commissioners, by virtue of the authority vested in us, proclaim March 10-16, 2019, as National Agriculture Week. We call upon citizens to acknowledge and celebrate the achievements of all those who, working together, produce an abundance of agricultural products that strengthen and enrich our community and our nation. In other business, the commissioners approved payment of the first third of the appropriation for the OSU Extension office in the amount of $33,000. The first quarter installment for the Chester Shade Historical Association was approved in the amount of $2,500. The commissioners approved a contract with Zurcher for a new 911 system for Meigs County 911. This will replace the approximately 15 year old system that is being used by the county and bring the system closer to meeting the new state standards for 911. Michael Struble was reappointed to a second, four-year term on the Gallia-Jackson-Meigs ADAMHS board, with a second board member to be appointed at a later time. Appropriation adjustments were approved as requested for the Meigs County Sheriff’s Office and the Meigs County Engineer.